EL SEGUNDO, Calif., Dec. 1, 2009 -- Boeing [NYSE: BA] announced today that DIRECTV 12 was shipped Nov. 25 from Boeing's satellite manufacturing facility in El Segundo to the Baikonur Cosmodrome launch facility in Kazakhstan. Upon arrival, the satellite will undergo final preparations for a December launch aboard an International Launch Services Proton/Breeze M rocket. 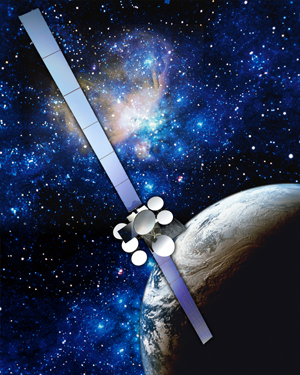 "Boeing has provided advanced satellite systems to DIRECTV for more than 16 years, and we are on track for a DIRECTV launch that will deliver superior commercial communications capabilities to our customer and help their business succeed through the use of Boeing technology," said Craig Cooning, vice president and general manager of Boeing Space and Intelligence Systems. "The successful launch and deployment of DIRECTV 12 will bring the best in digital television programming to DIRECTV's more than 18.4 million customers across the United States." DIRECTV 12 is the 11th satellite Boeing has built for the nation's No. 1 satellite TV service, enabling DIRECTV to continue to broaden its lineup of digital television programming services and expand its customer base. The new satellite will increase DIRECTV's high-definition (HD) capacity by 50 percent, and when combined with the DIRECTV 10 and 11 satellites that launched in 2007 and 2008, will enable DIRECTV to deliver 200 national and 1,500 local HDTV channels to millions of U.S. households. DIRECTV 12's national and spot-beam Ka-band payloads are designed to receive and transmit programming throughout the continental United States, Alaska and Hawaii.